The London Chess Classic is a chess festival held at the Olympia Conference Centre, West Kensington, London. The flagship event is a strong invitational tournament between some of the world's top grandmasters. A number of subsidiary events cover a wide range of chess activities, including tournaments suitable for norm and title seekers, junior events, amateur competitions, simultaneous exhibitions, coaching, and lectures. In April 2015, the London Chess Classic (LCC) was named as one of the three events that would comprise the inaugural Grand Chess Tour. By linking with Norway Chess and the Sinquefield Cup, a prestigious grand-prix style 'tour' was created that would play host to nine of the world's elite players, as well as the wildcard nominee of each organizer. It was expected that future editions of the tour would be expanded to include other events that could meet the standard. The LCC 2015 event will therefore feature the nine participating players of the 2015 Grand Chess Tour plus wildcard pick, Michael Adams. 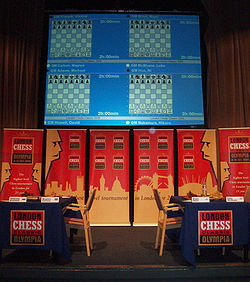 The inaugural 2009 edition was advertised as "the highest level chess tournament in London for 25 years", referring to the Phillips & Drew Kings tournament held in 1984. It was held during the same time as the Chess World Cup 2009. The field of eight grandmasters comprised the top four English players, and four international players, with top billing going to the former World Champion Vladimir Kramnik, plus the future World Champion and then-current number one in the live world rankings, Magnus Carlsen. The tournament was FIDE Category 18, and had a prize fund of 100,000 Euros including daily best game prizes and a 10,000 Euro brilliancy prize for the game voted the best of the tournament. The games were broadcast live at a number of sites including Playchess and the Internet Chess Club (with live expert commentary provided by Chess.FM). A major feature of the tournament was the use of a different scoring system, sometimes referred to as "Bilbao Rules"; players earns three points for a win, one for a draw and none for a loss. "Sofia Rules" also applied, whereby the players could not agree a draw without the arbiter's permission, only to be given when there was deemed to be no purposeful play left in the position. With the added incentive of lucrative best game prizes, the intention was to maximise the potential for entertaining and decisive games. There were 17 draws and 11 decisive games. The tournament was won by Magnus Carlsen, a victory that meant he would be world number one in the January 2010 FIDE world rankings list. Second place was taken by Vladimir Kramnik, and third place by David Howell, on tie-break from Michael Adams. The prizegiving took place at Simpson's-in-the-Strand, where Carlsen received a trophy and a cheque for the first prize (25,000 Euros). A trophy and 10,000 Euros brilliancy prize was presented to Luke McShane for his round five win against Hikaru Nakamura. The organisers announced that there would be another tournament in London in 2010. The tournament organiser and director was International Master Malcolm Pein, manager of the London Chess Centre and the executive editor of CHESS magazine. The Festival Organiser was Adam Raoof, FIDE Organiser and Arbiter. The guest of honour was Victor Korchnoi. The ceremonial opening move was made by Evan Harris, MP. Tournament partners included Chessbase and the Internet Chess Club. The main pre-tournament public relations event comprised a blindfold display at the London Eye between Nigel Short and Luke McShane. The tournament was simultaneous broadcast on London Chess Classic website, and the chess servers ICC, FICS and Playchess, as well as on Twitter. Note: the 'Points' column shows how the tournament would have been scored under conventional rules and these are the figures used for rating calculation purposes. Other tournaments organised during the festival included the nine-round Women's Invitational competition and nine-round FIDE Rated Open, which were won by Arianne Caoili of Australia and Jon Ludvig Hammer of Norway respectively, both with scores of 8/9. Korchnoi gave two simultaneous displays during the event. To raise money for charity, one ticket to play him was auctioned on eBay for £410. The 2010 edition was publicised as "The UK's strongest chess tournament ever". The prize fund was substantially increased from the previous year and world champion Viswanathan Anand replaced Ni Hua in the list of participants. Coupled with the advances in rating of some of the competitors, the effect was to elevate the tournament's status to Category 21 on FIDE's scale, making it the strongest ever held in the United Kingdom. The ceremonial first move was performed by the Indian High Commissioner, HE Mr Nalin Surie, and the format remained faithful to the previous year, adopting the three points for a win, one for a draw scoring system and 'Sofia Rules' in respect to agreed draws. Live expert commentary was provided to an audience of up to 400 at the venue itself and was also put out as a live web transmission. Lawrence Trent, Stephen Gordon, Daniel King and Chris Ward formed the core of the commentary team, but there were numerous contributions from other distinguished players, including guests of honour, Viktor Korchnoi and Garry Kasparov. The tournament was won by Magnus Carlsen, cementing his return to the world number one spot in the rankings. Anand and Luke McShane shared second place and interestingly, had the tournament been scored in the conventional way, then all three would have shared first place. The prizegiving was once again held at Simpsons-in-the-Strand, Carlsen being presented with the trophy and a cheque for 50,000 Euros by his part-time trainer and mentor, Kasparov. The tournament organiser and director was IM Malcolm Pein, manager of the London Chess Centre and the executive editor of CHESS magazine. The Festival Organiser was Adam Raoof, FIDE Organiser and Arbiter. The 2010 Festival won the English Chess Federation Congress of the Year Award. The tournament was simultaneously broadcast on London Chess Classic website, and the chess servers ICC, FICS and Playchess, as well as on Twitter and Facebook. Other tournaments organised during the festival included the nine-round Women's Invitational competition and nine-round "FIDE Rated Open". WIM Arlette Van Weersel of The Netherlands won the former with 8/9, while GMs Gawain Jones and Simon Williams (both England) shared victory in the Open with 7½/9. Korchnoi gave two simultaneous displays during the event and evening lectures were provided by GMs Jacob Aagaard and Boris Avrukh. The third edition once again featured the strongest chess tournament ever held in the UK. Organiser Malcolm Pein added a ninth player, the world number three Armenian Grandmaster Levon Aronian, ensuring that the world's top four players participated. With two extra rounds scheduled, play spanned two weekends and each day, one player sat out and joined the commentary team. Kramnik emerged the clear winner with 16 points. Other tournaments organised during the festival included the nine-round Women's Invitational competition and nine-round "FIDE Rated Open". IM Dagne Ciuksyte of England and WIM Guliskhan Nakhbayeva of Kazakhstan shared victory in the former with 7½/9, while Indian GM Abhijeet Gupta was outright winner of the Open with 8/9. Other tournaments organised during the festival included the nine-round Women's Invitational competition and nine-round "FIDE Rated Open". WGM Deimante Daulyte of Lithuania was the outright winner of the former with 7/9, while Armenian GM Hrant Melkumyan and Dutch GM Robin van Kampen shared victory in the Open with 7½/9. The format of the 2013 London Chess Classic was a "Super 16 Rapid" tournament (25 minutes + 10 seconds per move). The sixteen players were split into four groups, with the top two from each group qualifying for the quarterfinal knockout stages. Invitations were accepted by fourteen players and further places were allocated to whichever two players were leading the FIDE Open after round 4 on 10 December. Scoring was 3 points for a win, 1 for a draw, 0 for a loss. The €150,000 purse was distributed in this way: 1st - €50,000; 2nd - €25,000; 3rd-4th - €12,500; 5th-8th - €6,250; 9th-16th - €3,125. The participants of the Super 16 Rapid were banded according to their FIDE rapidplay rating, to create four pools of four players. Four preliminary groups were then constructed by randomly drawing one player from each pool, creating four groups of fairly equal standing. The draw was carried out on 4 December 2013 at Ravenscroft Primary School in Newham, with the assistance of the pupils. Other tournaments taking place during the festival included the double round robin Women's Invitational and nine-round FIDE Rated Open. IM Dagne Ciuksyte of England was the outright winner of the former with 7½/10, while Norway's Jon Ludvig Hammer triumphed in the Open with 7½/9. The tournament was once again organized and directed by IM Malcolm Pein. The world champion, Magnus Carlsen, declined his invitation due to the closeness of his world championship re-match with Viswanathan Anand. Anand indicated that he was able to play, no matter the outcome of his title match. The main tournament was a single round, all-play-all format, where the uneven colour split was decided in favour of the winners of the Elite Blitz contest (see 'Subsidiary events' below). Sofia Rules and football-style scoring (three points for a win and one for a draw) were used to discourage draws. Anand was declared winner of the Elite tournament on tie-break, due to scoring the only win with the black pieces. Guest appearances were made by former world champion Garry Kasparov, London Mayor Boris Johnson and Kenneth Rogoff, among others. Online commentators included Nigel Short, Danny King, Lawrence Trent, Chris Ward and David Howell. Analysis room commentary at the venue was provided by Julian Hodgson. With a shorter than usual main tournament, greater emphasis was placed on the additional festival events this year, with the elite players participating in the rapidplay and blitz tournaments. The Elite Blitz, like the main tournament, was scored using the 'three points for a win, one point for a draw' system. Adams was the winner, on tie-break from Nakamura and Kramnik. Other events were scored in the usual manner (one point for a win and a half point for a draw). Grandmaster simultaneous displays were provided by David Howell and Vladislav Tkachiev. The Pro-Biz Cup event comprised 2-player teams (one professional chess player, partnered by a top business leader, taking alternate moves) in a knockout format. Elite Blitz: Michael Adams, Hikaru Nakamura, Vladimir Kramnik 17/30, Anish Giri 16, Viswanathan Anand 10, Fabiano Caruana 9 (6 players, double round robin). Super Rapidplay Open: Hikaru Nakamura 9½/10, Anish Giri 8½, Fabiano Caruana, Viswanathan Anand, Vladimir Kramnik, Nigel Short, Aleksandr Lenderman, Eric Hansen, Daniel Naroditsky, Nicholas Pert, Alon Greenfeld, Simon Williams 8 ... (405 players). FIDE Open: Kamil Dragun, Bai Jinshi 7½/9, Vladislav Tkachiev, Bartosz Socko, Aleksandr Lenderman, Alexandr Fier, Alon Greenfeld, Jacek Stopa 7 ... (211 players). Challenge Match: Gawain Jones defeated Romain Edouard by 4-2. Final game 6 was played at Heathfield School, Hampstead, on December 15 (otherwise held alongside the main tournament). Pro-Biz Cup: Anish Giri and Rajko Vujatovic (Bank of America, Merrill Lynch) defeated Vladimir Kramnik and Russell Picot (HSBC) in the final. In 2015, the London Chess Classic joined with Norway Chess and the Sinquefield Cup to form the Grand Chess Tour. Michael Adams was selected as the tournament wildcard and joins the other nine players already participating in the Grand Chess Tour. British Knockout Championship: David Howell won by defeating Nicholas Pert in the final 4−2. FIDE Open: Benjamin Bok won with 8/9. Super Rapidplay Open: Luke McShane won with 9.5/10. Pro-Biz Cup: Hikaru Nakamura and Josip Asik (CEO of Chess Informant) won.